Dr. Theodore V Benderev, MD is a Doctor primarily located in Corona, CA, with another office in Mission Viejo, CA. He has 40 years of experience. His specialties include Urology. He speaks English. Dr. Benderev has received 1 award. The overall average patient rating of Dr. Theodore V Benderev is Great. Dr. Theodore V Benderev has been rated by 11 patients. From those 11 patients 7 of those left a comment along with their rating. The overall rating for Dr. Theodore V Benderev is 4.3 of 5.0 stars. Dr. Benderev and team are great. I had the procedure done in Orange County less than a week ago and everything has been fine so far. The actual procedure was very easy and Dr. Benderev does and excellent job of talking you through what he is doing while engaging with you in the conversation so that you can overcome the inherent unfamiliarity and anxiousness. Soreness afterwards was super minimal and the overall process was very smooth and easy to understand. 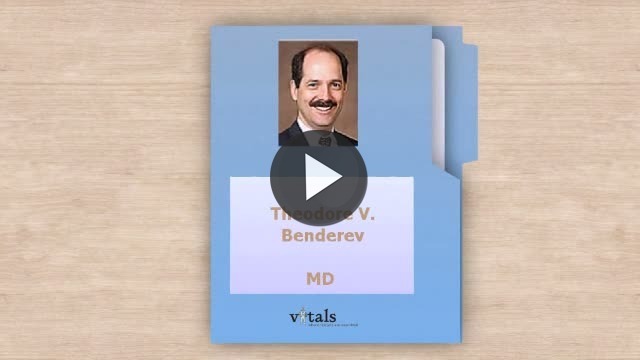 Take a minute to learn about Dr. Theodore V Benderev, MD - Urology in Corona, CA, in this video.